I've never been secretive about my own struggles with mental health. Then again, I guess I've never been hugely explicit about it all either. Whilst I'm not exactly a private person, what with the majority of my life willingly splashed across the online world, there are little slivers of my life that I like to take control over by purposely choosing not to share them. My mental health is amongst the things on that list. I encourage people to talk about their mental health in whatever way they think will help them however, I personally don't get much out of talking about my own mental health with strangers who don't know me or with those who can't help me professionally. For me, it seems like inviting a lot of opinions and voices into my brain when it's already very crammed up there. It actually helps my mental health to keep the ins and outs of my mind this side of the curtain, offline, and to only talk about it with people I am close to and/or professionals. Having control over that little piece of my world and making the conscious decision not to broadcast when I'm feeling low and instead, turning to a friend or a family member, makes me feel like I'm already more in control of my own brain than I thought I was. (I don't judge anyone who does things differently! Whatever helps people, helps people. It's all deeply personal and this is just me!) However, not talking explicitly and in depth about my struggles has never stopped me from telling the world outside my bubble that I am, in fact, struggling. There have been many posts scattered throughout my online history depicting just that because I recognise there is a stigma and I'm all for breaking it. It's official. I'm a workaholic. This year alone (so far) I've rehearsed for The Addams Family and completed 150 shows of the UK tour, sung in parts for two other musicals, finished and published a book which I'm currently doing signings for across the country, started writing something new and in the midst of it all filmed, edited and uploaded 54 YouTube videos. I'm not complaining. I love my life and I wouldn't do any of it if I didn't adore it. I also know how lucky I am to be able to have these opportunities which is probably why I work as much as I do! I don't want to waste a single opportunity I'm fortunate enough to have. But eventually the result is a day like today. When something's gotta give and today that something was my voice. I rely on my voice to carry me through and so when it goes, I feel like I've lost a vital part of myself. Without it I feel utterly useless and incredibly lost. And so after a lot of crying and a lot of cuddles from Scott, Oliver, Sam, Cameron and some foul throat remedy that Dickon threw together...I knew I needed to take the day off. And I only came to the conclusion that I'm a workaholic when I got to my hotel room and sobbed because I wasn't on that stage with everyone else, mucking in and being kooky. When I'm physically not able to work, I fall apart. I need to learn how to slow down, chill out and rest when it's needed. (Then I need to learn to not feel guilty when I do). TL;DR: today sucked. Tomorrow will be better. You may not have heard of The Blurt Foundation. They're a social enterprise dedicated to helping those affected by depression. I'm not sponsored by them nor have I ever worked with them before but they've certainly helped me over the years. They created something called The Buddy Box. I've received two in my lifetime. The first by someone named Kiely and the second came from The Blurt Foundation themselves. The Buddy Box is a marvellous little package containing things to try and brighten your mood. Socks, hot chocolate, amusing little tea coasters, affirmation cards...the box is always choc-a-bloc with happiness it's hard not to smile when you open one. If you've never heard of them, I highly recommend you check them out HERE. I follow The Blurt Foundation on twitter and on April 1st they started something called the Self Careathon and...I've decided to take part over the course of April in blog form. Some blogs may be long arse essays, some may be short and sweet but I thought it would be something good for my own mental health, something that allows me to open up a little more about how I'm feeling and something that will encourage others to do the same. It's also a chance to get the most out of my blog! I think The Blurt Foundation themselves are taking part in this challenge on instagram so head over there to check out their posts too and please take part yourselves however you wish! 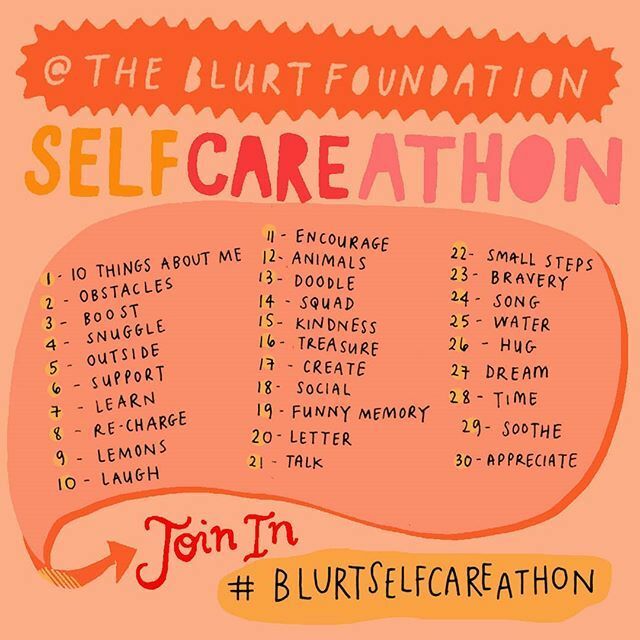 Just make sure to use the hashtag #BlurtSelfCareathon !!! I'm a day behind but here we go! 1. I like to pretend I'm organised but I'm (not-so-)secretly very messy. My flat is in constant disarray. It's a mixture of having too much stuff to fit into my teeny weeny flat and no time to organise anything. I only ever invite close friends over who are happy to climb over boxes of books, posters and letters and sit in amongst empty cans of Coke Zero and millions of strewn sharpies. Dark rum and ginger beer with a slice of lime. Delish. 3. If I could live in boots, I would. I say that but I pretty much already do. I've had my Vonda Doc Martens for a year now and I've worn them nearly every day in all weathers. Love 'em! 4. I have a strange obsession with painting my nails. I'm terrible at it. I get it everywhere but I find it so relaxing and my colour of choice is nearly always black. 5. I don't read nearly as much as I used to and I miss it. This is due to the fact that I write books now which is a wonderful excuse but reading got me into writing in the first place and I need to find more time. 6. I feel a little bit lost 100% of the time. People constantly ask me how I have my life so "together". It's flattering that people think this but truth is, I'm just as lost as everyone else. I must just be a better actress than I give myself credit for. I know I can do anything if I put my mind to it! My parents instilled that belief in me a very long time ago. But just because I can do something, doesn't mean I particularly want to or that I will enjoy doing it or that I will have gained anything from it once it's over. They say success lies outside of your comfort zone which I agree with to an extent but, in my experience, if you leave your comfort zone just because you feel like you should rather than leaving for good reason, your endeavours are, more often than not, fruitless. If I'm going to leave my comfort zone, it has to be for the right reasons and for something that I deem worthy. It has to be for me and my reasons, alone. 8. My memory is terrible! Over the past four or five years, my memory has become seriously crap. My theory is, it's so full of scripts and song lyrics now that there's little room for anything else, including my own schedule! 9. I don't like attention. Audiences can applaud Eponine, Truly, Wednesday, Beth or whatever other character I play as much as they like. I like having my work recognised. However, as soon as it comes to me claiming recognition, I want the floor to open up underneath me and hide me until it's over and everyone's gone home and no one cares anymore. I could barely even bring myself to bow at my own concerts this weekend. I could barely even bring myself to do the concerts at all let alone bow at the end! And this is new. I never used to be like that. I don't know what changed. But something did. 10. I really want a black Sphynx cat. I think they look like dragons. I really want a dragon. PS: Yes to the black sphinx dragon cat - it could be your own tiny little Toothless! Your own concerts are also your work! Maybe if you see it that way, you can accept the applause. The audience didn't decide to applaud just because they think you're a good person, but because they enjoyed your performance and it made them feel good, the same as when you're acting in a story. I feel the same way with number 9. I used to be an overly-confident, hyper kid who was always first to audition or sing or even put up their hand in class. But recently, I have started to be shy and stammer a lot, something I never used to do. My teachers and new friends (I moved into high school) think I'm a shy, low confidence girl but that isn't who I used to be. I think it may be due to extreme bullying that I experienced and my loss of childhood friends (but that's another story that I'm not ready to relive) yet I hate people even telling me I got a question right. The only place I feel like the old me is in our small drama suit playing another character, telling their story not my own. I've probably now spoken too much but I do hope you are having a good day. Smile and make a wish. I do hope it comes true. I've decided to do it as well. I'm a bit behind but I'm going to catch up right about...now. Dark and stormys are one of my go-to's as well! I've tried starting a blog and a youtube channel to give my very anxious brain something to do and nothing had ever really stuck. This sounds interesting though! I can't wait to try it :D thanks Carrie!! !